These magnets make a perfect gift for the Pet Lover you know. Magnets are photo-realistic and there are many breeds to choose from. 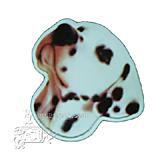 Flexible vinyl magnet of your favorite dog breed. Magnet size varies by breed, average size is 3 inches by 2.5 inches.